How do you create a memorable fan experience? Ken Babby, Owner/CEO Jacksonville Suns will join us to discuss the best practices he has brought from his minor league baseball franchise, the Akron RubberDucks. The RubberDucks marketing and promotional work for the 2015 season landed them the Larry MacPhail Award for the most outstanding and creative marketing and promotional efforts in Minor League Baseball. His strategy in Jacksonville is already paying dividends, and JAMA is excited to bring this leader in his field to our members. 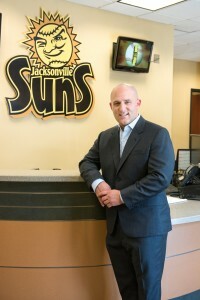 Ken Babby, a native of Potomac, Maryland, opened a new era of Jacksonville Suns baseball by becoming Owner and Chief Executive Officer of the First Coast’s longest-tenured sports franchise in September 2015. Babby is the founder of Fast Forward Sports Group and was named one of Sports Business Journal’s 2016 “Forty Under 40,” recognizing excellence and innovation in sports business careers – all before age 40. Babby, 36, is the youngest multi-team professional sports owner and looks to build on the Suns’ storied tradition following recent success with his first Minor League Baseball franchise, the Akron RubberDucks, a team he has owned since October 2012. In his first three seasons with Akron, the team saw tremendous growth in attendance, moving from ninth to fourth in the Eastern League standings, while welcoming more than 340,000 fans to Canal Park in 2014 and 2015. Babby has also made more than $6 million in personal investments for improvements to Canal Park that include the largest HD videoboard in Double-A (fifth-largest in Minor League Baseball), a high-end, full-service Grill and Bar, and four new premium party areas. The team’s identity change to the RubberDucks prior to the 2014 season helped move the club into the top 25 in merchandise sales for Minor League Baseball. The RubberDucks’ marketing and promotional work for the 2015 season landed them the Larry MacPhail Award, which goes to the Minor League Baseball team with the most outstanding and creative marketing and promotional efforts. Since Babby’s acquisition of the Akron club, the franchise has grown attendance by more than 27.5%. Prior to Akron, Babby spent 13 years in various marketing positions with the Washington Post and its online and social media counterpart, Washington Post Digital. After starting as a summer intern with the newspaper in 1999, Babby rose through the ranks, eventually attaining the position of Vice President of Advertising, and most recently, Chief Revenue Officer of Washington Post Media and General Manager of Washington Post Digital. He serves on numerous boards in Northeast Ohio. In Jacksonville, Babby is on the 2016 Jacksonville Chamber of Commerce Board of Directors. He is also the chair of the Baseball Internet Rights Company (BIRCO), which manages the digital and interactive media rights of its member Minor League Baseball clubs and leagues.